Fourth generation blowing agents described as hydrofluoroolefins (HFOs) are coming on the market as replacements for the current hydrofluorocarbon (HFC) group of products. The European F gas regulations which aim to ban the use of chemical substances with high global warming potentials (GWP) apply to the currently available hydrofluorocarbons that are used as refrigerant gasses for air conditioning and as blowing agents in rigid polyurethane foams. 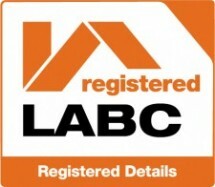 Under the regulations HFCs will no longer be able to be used in Europe after 2023. The new HFO products available have significantly lower GWP values than HFCs but maintain the thermal insulation performance characteristics of their predecessors. Due to the phase out of the blowing agents now used, there is a requirement to reformulate existing rigid foam systems. Isothane Ltd has a range of rigid polyurethane foam systems based on the 3rd generation blowing agents or HFCs. The foam systems are developed for in-situ on site application, where the products are supplied as two components, a resin blend and an isocyanate. The two components are then processed using specially designed machinery to either spray or dispense the finished foam product. A key requirement is that the resin component has a good shelf life (or in can stability) and will be able to be processed immediately without the need for pre-mixing or adjustment. Isothane’s current rigid-foam formulations have excellent in can stability, can be stored for up to six months and used immediately without any unnecessary preparation. Isothane’s rigid foam formulations have been reformulated to use a HFO blowing agent in place of the HFC blowing agent. It is essential that the shelf life of the new products are evaluated to ensure they remain suitable as per customers’ expectations. Along with the other key performance requirements of the products such as thermal resistance, processability, and yield etc. 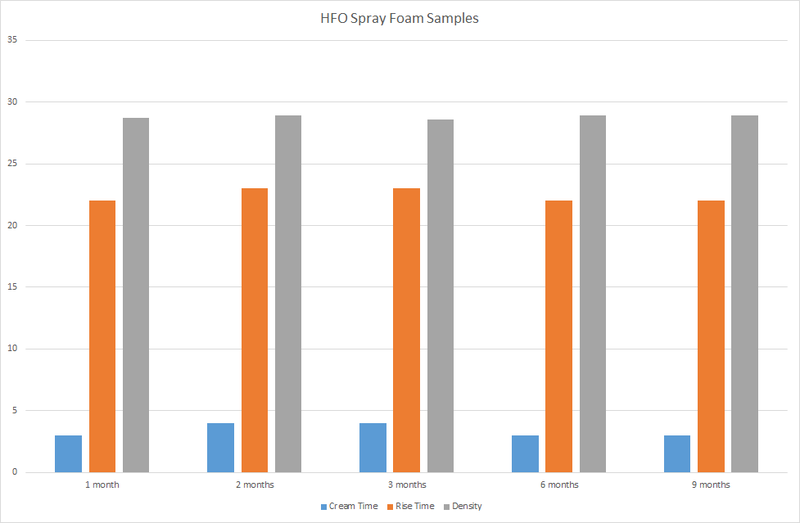 Five experimental spray foam resin samples were produced using the HFO blowing agent. The reaction times and foam density of each sample was measured after one day to ensure they were within the required specification. Control samples of HFC based spray foam resin where also prepared and measured. All ten samples where then stored in the same location at 23°C+- 2°C , RH 50% for a period of nine months. One sample of each type was then retested after storage for one month, two months, three months, six months and nine months. After storage for up to 9 months both the HFC based samples and the HFO based samples remained within specification with no significant change to cream times, rise times, density or viscosity. The appearance of the resin samples also remained unchanged. Duratherm spray foam samples produced using 4th generation HFO blowing agent produced good in can stability results, comparable with product made using HFCs. The samples under test remained within the required specification after a storage period of 9 months. This would allow a shelf life of 6 months to be applied to Duratherm spray foam systems made with HFO.